The Spruce Street bike lane is covered with potholes and other surface irregularities for the entire length of the 1500 block. Among these, there are at least three large holes that are extremely dangerous, causing bikers to have to weave around them, at times entering the car traffic lane. Please fill the holes immediately and then repave this block! WAWA: No Parking Areas are not clearly delineated with articulated signage and lines. Cars are parking blocking the loading zone (also not clearly delineated) causing blockage of the bike path and adjacent streets etc. Bike lane lines are faded. Hi there and thanks for reporting. Are these SEPTA buses that are idling, or a private fleet? Hi! Thanks for reporting. The Clean Air Council has taken note of the location of this idling vehicle. We are trying to gather data of idling hot spots, so please make sure to write again if you see a vehicle idling at this location. We will address the issue by alerting the city's Air Management Services, hanging anti-idling signs, and discussing the problem with local businesses. Thank you for your help in creating a smog-free city! There is ALWAYS a car stopped in front of this 7/11, and to add insult to injury - it's usually a police car, which could illegally park somewhere else, without endangering bicyclists. as they are all referring to the same spot. "Your issue has been outstanding for 1365 days." No kidding, because this site does nothing. Cars are chronically parked in the bike lane here, causing bicyclists to ride in the motor vehicle lane. Most common offenders are the police! Recently I saw vehicle 1721 in this zone. Why has this not been sent to the 17th District? Shouldn't they be enforcing this? Especially when it's a police car? Still...the cops keeping our streets unsafe and setting a bad example. 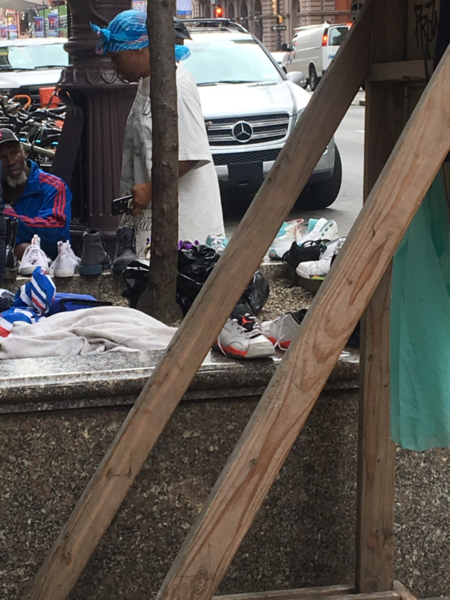 Homeless people using the space outside of the wawa on South Broad street to dry and wash their clothes. Clothes and shoes and belongings are spread out everywhere on the street and planters. My business is located across street - this needs to be addressed. contractor or utility removed rack to fix sidewalk. needs to be reinstalled. Comments:	contractor or utility removed rack to fix sidewalk. needs to be reinstalled. Thank you for submitting the following request to the Philadelphia Streets Department. It has been referred from the Customer Service unit to: Right-of-Way. tables, couches, bagged trash, etc dumped two weeks ago.